Are You Missing Patients Eligible for Testing? Are you doing everything you can to help your patients detect breast cancer early? This could amount to 11,477,635 unaffected women who are eligible for testing. While genetic testing has become much more accessible, many practices still don’t have the tools to identify the patients that need it the most. 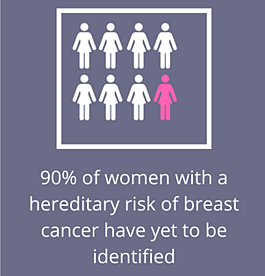 This Breast Cancer Awareness Month bring the power of genetics to your program with CancerIQ. CancerIQ makes it easy for providers to offer cancer risk assessment services to every patient that walks through the door. In 2014, an interdisciplinary team of experts in clinical cancer genetics convened to solve a growing problem – patient access. With such a small group of trained practitioners with genetics expertise, there was a need to make the process more efficient, team-based, and scalable. We aim to bring predictive analytics to the world of cancer care, starting with simple tools to predict, pre-empt, and prevent adverse outcomes in cancer.